Dr Dan does not sell or work on saddles, but will check your saddle for fit. He has extensive training in body structure and anatomy and how it relates to saddle fit. He has been a representative for Prestige Saddlery and for Schleese Saddlery in the past. Many times saddle fit will be included in the exam for chiropractic or acupuncture bodywork, especially if the withers or back are found to be sore. A saddle tracing can also be performed for clients needing to send a tracing when purchasing a new saddle or having their current saddle reworked. There are 6 basic key elements to fitting a saddle properly to your horse. There are actually a lot more than this but the 6 basic ones will get you in the right direction. Tree Angle – is the angle of the tree and how it sits across the withers. It should allow for shoulder movement and the angle should be somewhat parallel to the withers. Tree Width – is the width of the tree from panel to panel and how it sits across the withers. It should be wide enough to allow for shoulder movement, not crushing the withers and not so wide that it allows the pommel to rest on the withers. Panel Contact – the panels should make even contact along the back of the horse. It should not have any gaps or spaces not touching the horse. It should not bridge or rock or have major worn areas. The panel should be firm but not hard. 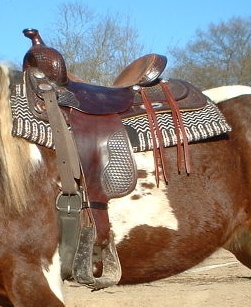 Gullet Width – is the width between the panels along the saddle from front to back. It should have enough space that it does not allow for contact with the spine and the sensitive ligament that runs right next to the spine. An average man’s hand of four fingers width should be able to slide easily between the panels. Balance – when looking at the saddle from the side on top of the horse it should be balanced. It should not have a raised pommel or a raised cantle. Symmetry – when looking at the saddle from the back on top of the horse it should be even and be the same on both sides of the spine. it should not twist or be raised on one side or the other. These are the basics of saddle fit. It is much more involved to really fit a custom saddle, but if you are looking at your saddle, these 6 basic points will help you in determining if your saddle is actually fitting correctly on your horse. If one of these points is a problem, it may affect your horses’ behavior and certainly its movement. If these are not optimized to fit the horse then your horse will not have optimal movement. You will need to check saddle fit at least once every 6 months. Fit your horse correctly and you will have a comfortable enjoyable ride.